techniques and disciplines to translate goals into reality! Less than one percent of adults have clearly stated goals – yet those who do have vision and can therefore make choices towards achieving those goals. 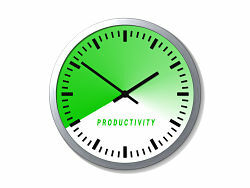 Are you leaving your productivity to chance? We each have our own unique preferences and approaches to situations. As a result what helps one person may be a hindrance to another. While a little planning helps some people feel much better, it can represent an unbearable constraint for others. Where are you going? What are your goals? be counted and not everything that can be counted counts! – What counts in your world? Do your personal resources allow you to achieve your goals? Assessing ability and enthusiasm to maximise goal achievement. Personal development planning. Know what you want to learn or change and what you need to do to achieve that. Give me time – free me up! Identifying what you should Stop ?Start ? Continue? Learn to control time instead of it controlling you.